With products that work to strengthen and maintain the condition of your tresses, AK Lounge is your one-stop shop for the best in hair care. Here’s a glance at just some of the brands we offer. For a custom approach to color-treated hair, Pureology offers breakthrough solutions to keep locks strong and vibrant, even after exposure to harsh chemicals. This line of products features ZeroSulfate ingredients for a gentle cleanse, AntiFadeComplex elements with antioxidants for a healthy glow, and a wide range of hair care solutions and stylers to handle any type of color-infused hair. Add definition to curls and waves, diminish frizz, volumize thinning strands, nourish and revitalize weak, lifeless hair…the benefits are aplenty. Not to mention, you can add shine to red, copper, and platinum locks, strengthen highlighted strands, and rejuvenate mature and aging hair. This collection is comprised of three, easy-to-use products aimed at restoring damaged strands for healthier, stronger-looking hair. The Bond Multiplier starts by locating and repairing broken disulfide bonds, while the Bond Perfector continues that process until hair is left with the best defenses against harsh chemical and thermal effects. The Hair Perfector is the final solution to rebuilding bonds and is designed to provide optimal protection against future damage to hair outside the salon. Say hello to ultra-smooth and shiny hair without the need for complicated treatments or techniques. 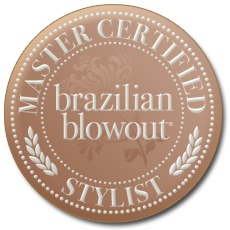 Brazilian Blowout products offer a safer, easy approach to straightening without the harmful effects brought on by heat. A protective protein layer reduces risk of damage while leaving hair calm and manageable, with results for up to 12 weeks. Plus, you’ll experience frizz-free tresses with a healthy foundation, thanks to Acai-infused ingredients. Meanwhile, the split end correction rebuilds weakened strands to fight against damage, while volumizing products utilize amino acids and proteins to leave you with that oh-so-desired definition. Permanent shades: Dusty Lavender, Silver Pearl, Amber Rose, and Rose Gold. Demi-Permanent shades: Silver Smoke, Dusty Lavender, and Rose Gold. Dual Booster shades: Aqua Blue, Ultra Violet, Pink Glow, and Turquoise. Direct Dye shades: Mint of Steel, Arctic Blue, Lavender Lust, Pink Diamond, and Charcoal. Whether you want to don the fashion-forward looks of your favorite celebrities or start a hair trend of your own, #mydentity lets you embrace your creativity with fun and vivid shades that help you stand out from the crowd. Do you dream of having the perfect extensions with colors that really pop? Donna Bella Hair Extensions are available in a wide range of shades, from simple tones such as black, brown, ash, and blond, to unique options like fuchsia, green, ombre, and silver. With lengths from 12 to 22 inches, there’s a size fit for every head of hair. Plus, most are made from 100% human Remy hair for a completely natural and smooth appearance. Opt for the beading approach via I-Link Pro extensions, or the natural-fused method with Kera-Link Pro. Tape-In extensions use newly patented tape to hold firmly in place, while the Flat-Tip option offers 18 inches of straight tresses with flexible movement. For a quick and easy application, try the Ready-to-Wear collection with human hair or synthetic strands. You’ll find clip-ins, full head coverage, single clips for easy highlights, solo (halo) extensions that seamlessly hide under your hair for a flawless finish, and clip-in bangs for that side-swept or straight-across flare. With so many choices to choose from, there’s a Donna Bella look to take on any type of style! Infused with shea butter and orchid oil, each and every product of the Joico collection is guaranteed to replenish bonds and nourish for the most brilliant shine possible. The Vero K-PAK line offers everything from vibrant hair coloring to age defying techniques to formulas with health and strength in mind. You’ll also find plenty of ultra-powerful shampoos and conditioners designed to boost and maintain hair color without the risk of fading. From lighteners, volumizers, cleansers, textured stylers, hydrating formulas, and finishers for long-lasting results, there are plenty of custom products to keep your hair radiant and full of life for years to come. Scruples offers a line of cruelty-free products that are powerful enough to take on even the finest, coarsest, and color-treated hair, courtesy of the ultra-effective PBX technology that’s designed to lock in moisture and boost shine. Plus, UV absorbers protect against the sun, while hydrolyzed proteins infuse hair with plenty of volume. Try the low-ammonia hair color systems, lighteners, fade-resistant formulas, and textured hair products for strands that are incredibly vibrant and built to last. With Pravana, you’ll find products that are paraben- and sulfate-free for clean results every time. Combine that with botanical extracts and natural proteins, and you have a collection that’s designed with healthy hair in mind. Whether you’re looking to color your hair with vibrant shades or lighten strands without harsh after effects, we have just what you need. Not to mention, the after-color care, styling, and texture services offered are nothing to overlook either. For a customized hair care routine, Pravana delivers plenty of excellent products to keep your locks looking gorgeous and radiant. Before we tell you what Biomega does for your hair, let’s tell you everything it doesn’t. It doesn’t fill your hair with sulfates, gluten, or sodium chloride, but it does pamper your tresses with omega-rich oils, moisture and shine, and renewed vigor and elasticity. Whether your hair has been treated with color or it often feels dull and flat, Biomega offers a rich line of shampoos, conditioners, styling solutions, hairspray, and shine-infused products for that desirable hair that everyone will envy. Are you looking to liven up your hair with a pop of color? If so, Iroiro offers premium, natural semi-permanent hair colors for any type of style and personality. You’ll find all colors of the rainbow to choose from, including dark and mysterious shades like black, violet, plum, and dark red, as well as bright and fun tones like turquoise, pink, orange, yellow, and platinum. Plus, each and every product is full of natural and healthy formulas to boost performance and shine. Want to know what makes these colors so effective? Iroiro uses only 100% cruelty-free ingredients with organic coconut oil for excellent conditioning and radiance. They also feature a yuzu-cranberry fragrance that’s free of several synthetic and harmful petrol-based chemicals you’d find in many other hair care products. These elements combine to deliver stunning results with the longest-lasting colors available. There are plenty of hair care products out there, and these are just a few of the options we offer at AK Lounge to repair, protect, and maintain every strand. We are always testing new products to ensure each and every client leaves our salon feeling as radiant and confident as ever. Whether you’re looking to match those celebrity hair color trends or you simply want to fortify and replenish your locks, AK Lounge is the ideal stop for all of your hair care needs.